I love wrapping presents! I always try to have coordinating paper, tissue paper and ribbons. I try to get creative with my packages too. And I really enjoy making gift basket type presents. When we lived in our apartment, gift wrapping was always done on the kitchen table. When we thought about moving, I always thought I'd have a gift wrapping station somewhere in my craft room. Although, I do wrap gifts on my craft table, I don't have a dedicated spot for pretty wrapping papers and all the other stuff that's needed for pretty presents! I keep my craft tools in galvanized buckets in the center of my craft table and that is where my gift wrapping "tools" live as well. Scotch has a couple of gadgets that I can't live without (well, can't gift wrap without). 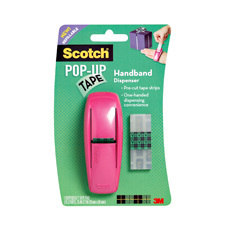 The first one is the Scotch Pop-Up Tape Hand Dispenser. This thing is great! The pre-cut strips make it really easy to get a piece of tape with one hand while holding your paper in place with the other. No more fumbling for the disposable dispenser to tear off a piece of tape! If you don't already have one of these, it's a must-have for your gift wrap station, craft room or home office! You can follow this link to print a $1 off coupon for the Pop-Up Tape Dispenser or Pop-Up Tape Refills. 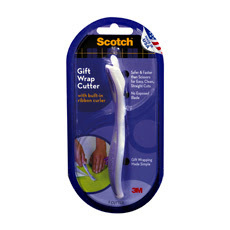 The second handy little gadget is the Scotch Gift Wrap Cutter. This little gadget is great for cutting wrapping paper and has a built in ribbon curler, too! I keep one in my craft room, but I keep a spare in the desk drawer in the kitchen. It's really handy for clipping coupons, recipes or other magazine articles! There's a $1 off coupon for the Gift Wrap Cutter, too! Just follow this link to print your coupon! These coupons expire 7/31/10, so be sure to print yours out today!